“Cortana? Hey, Cortana? Remind me to...” Damn. She’s gone. And that’s basically the Cortana experience in Build 9926 of Windows 10. Microsoft’s digital assistant has migrated to the desktop, but she’s just not as reliable as her Windows Phone iteration. After Microsoft made Build 9926 available to the public on Friday morning, I downloaded it using my existing Windows 10 preview build. 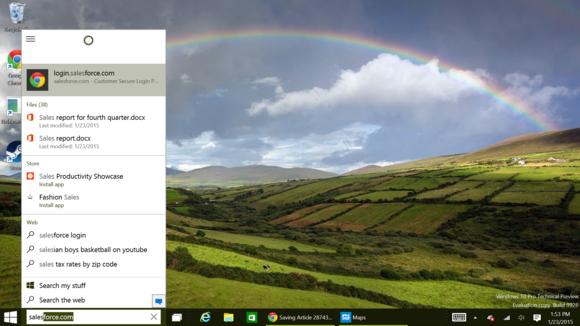 The download was relatively quick, but if you grab it yourself, make sure you have your existing Windows build updated before you install the new build. If you don’t, you may receive a “this update failed to install” error. We already tried out Build 9924 in Redmond, and we’ll have a more in-depth hands-on of 9926 a bit later. But for now we want to focus on Cortana, the flagship addition to Windows. So far, she’s a bit flaky. Cortana’s notebook is still present, with all of your interests and topics. Cortana will want to access your calendar appointments, contacts, and location, among other things—pretty par for the course, especially if you’ve used Cortana on a Windows Phone. You can also tell Cortana what to call you, including your name, “Master,” “Khahleesi,” or anything else. 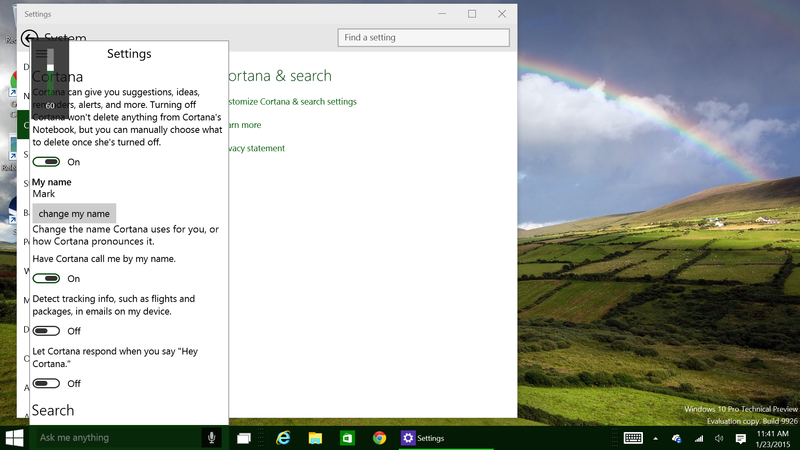 Once enabled, you can control Cortana via the Windows 10 Settings menu. Make sure you do this, as this is the only way to turn on Cortana’s active listening feature. With that turned on, you can say “Hey Cortana” to activate Microsoft’s digital assistant. Note that this feature will eventually arrive on Windows Phone as part of a feature that will accompany the Denim update. For now, however, it’s pretty much exclusive to the PC. Unfortunately, Cortana’s a busy virtual woman—attracting her attention via spoken commands seems to work only intermittently. If you give Cortana a few moments, saying “Hey Cortana” usually prods her into action. But her attention will wander quickly, so if you don’t say what you want almost immediately, she’ll begin “thinking” about your request. Lost in her thoughts, she won’t respond for a few seconds. Alternatively, she’ll simply ignore you. My natural instinct was to raise my voice and begin insistently saying “Hey Cortana” over and over again—just as my children do when they want my attention. But that also failed to provoke a response. I had better luck tapping the microphone icon. When I did, I could begin asking Cortana to help me out. Even then, a lengthy query such as “Who will win, the New England Patriots or the Seattle Seahawks?” (a query that works fine on Windows Phone) failed to work. Cortana just gave up after about six words or so. Oddly, sometimes you’ll see your query appear as words in the text box, as you speak them. Other times, Cortana will quietly chew over your request without indicating that she’s processed it. One other note: To launch another Cortana query, you have to shift focus away from Cortana by tapping another area of the screen or by doing something else. An all-too common response, unfortunately. 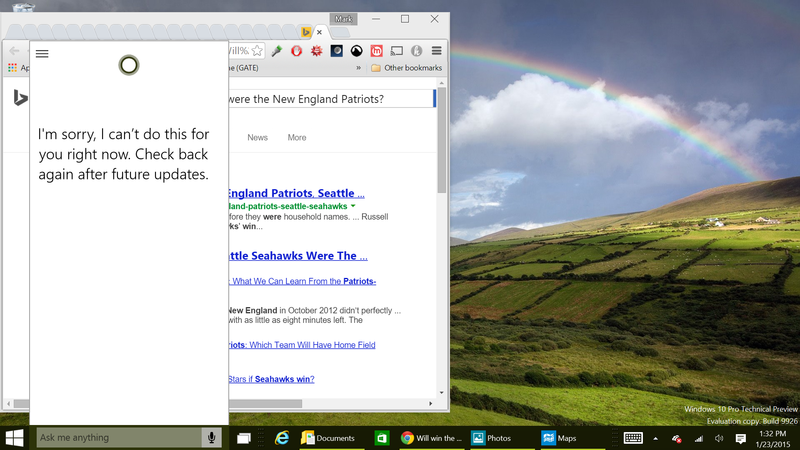 Cortana will also take requests and plug them in as Bing search queries. With math problems, that works just fine. But for navigation questions, you’ll be forced to manually bring up the new Maps application and perform the search yourself. Note that search queries carry the Cortana icon, but they’re really only accessible by entering a search term in the search box. Here I searched for “sales.” But if I asked Cortana about this, the search wouldn’t work. Note that Cortana also governs local search, but she can’t yet search for documents or files. Unfortunately, like squabbling sisters, Windows 10 Cortana doesn’t talk to her counterpart on Windows Phone, even though I was signed in to the same Microsoft account. I tried setting reminders on a Lumia Icon with the latest Windows Phone 8.1 Update, and they wouldn’t pop up on my Windows 10 machine, and vice versa. Microsoft really needs one Cortana to talk to the other if it’s to knit its Windows ecosystems more closely together. 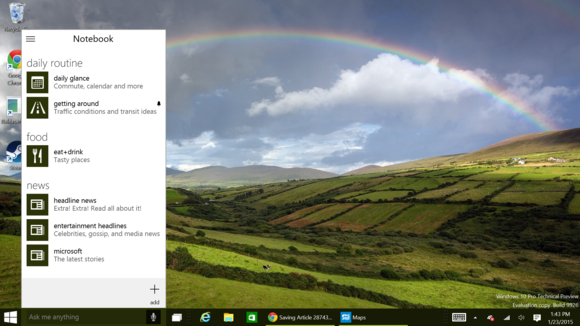 General fact-based queries work well with Windows 10’s Cortana. For now, if you really want the full Cortana experience, stick to Windows Phone. It seems obvious (right?) that Cortana on Windows Phone and the PC will eventually have the same functionality, and exchange information back and forth. But while the new Build 9926 is stable enough in general, Cortana is like Eliza Doolittle in My Fair Lady: She’s going to need some refinement before she can enter polite society.